Christmas cheer at Windmill View in Clanfield! Residents at Windmill View in Clanfield have held a children's art competition for those who will be enjoying their first Christmas there. The task was to use their imagination and design a Christmas card that could be traditional, modern or funny. The winning entries received a pack of cards for their family and friends and also saw their designs printed and delivered to each home at Windmill View. Competition was tough but the enchanting designs by Natasha Knight and Ellie Drysdale were selected as the winners. 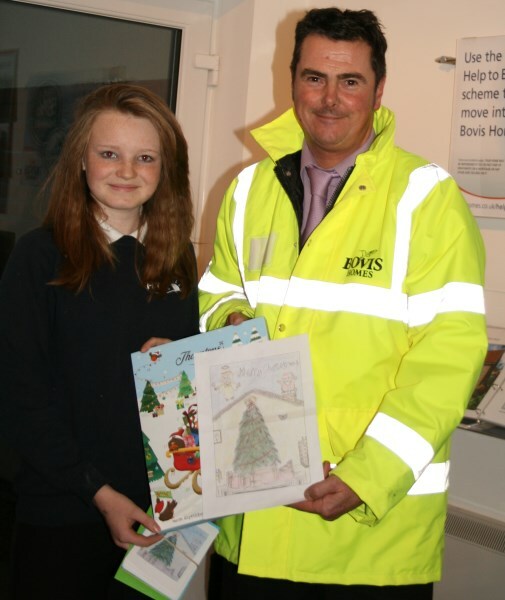 Natasha was presented her prize by Colin Macleod, Site Manager for Bovis Homes and Ellie was presented her prize by Rob Saunders, Site Manager for David Wilson Homes. Colin said: "There is a great community spirit developing at Windmill View, which is really exciting to be a part of. The children tackled the Christmas card competition with huge enthusiasm and talent and judging proved extremely difficult. "But in the end we went for the designs by Natasha and Ellie, which were really colourful and imaginative and, we thought, reflected this new community and its residents." This has been just one of recent community based events at the development, with a spectacular bonfire display held in November and Christmas party planned - giving residents the chance to catch up with their neighbours and make new friends. Once completed, the development will include a Community Centre, tennis court and junior football pitch which will be used by the residents along with the local community. View the latest prices at Windmill View here. The Government backed Help to Buy scheme and Home Exchange are both available at the development. For further information or to arrange an appointment to view, please contact the sales team on 02392 009480. The sales offices and show homes, which are located off Green Lane PO8 0LG are open daily between 10am and 5pm.